Insight Advertising, Marketing & Communications: Video Production....So, How Much? "I'd like a video for our business. How much? 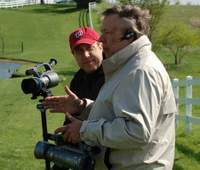 Over the years we've done lots of video production in all kinds of settings in all types of weather. (This day it was 14 degrees! We'll not forget this four hour shoot!) Every project is different, yet they are all the same in that the actual "shoot"...for us...is the usually easiest part of the project. The tough stuff comes in distilling the message, writing the scripts, setting the shots and editing the final piece. Sometimes it's the stuff the client never sees that eats up the time and adds to the cost. So when we're asked how much we answer: "Depending on what you want and how you want to present it, $1,500 to $5,000 for each finished minute." That usually shocks the socks off of some...and they might be surprised to learn we're some of the least expensive in the business. The next question: "How come such a difference in price?" Again, it depends on what we have to do. Recently we finished a product for a client that took ten hours in the edit...for a four minute video. Add to that the fact they wanted original music, graphics and voice overs....every item has a cost associated with it. I remember the very first production we worked. It was a ten minute piece (TOOOOO Long for today's world) we did it fifteen years ago. The price "then" for the entire package including talent was $1,000 a minute. That same piece today? More like $5,000 a finished minute. How much? How good do you want it to look? Michael P. Libbie - Insight Advertising, Marketing & Communications...thanks for coming by!